We love our house but it has a serious flaw. It has virtually no storage. It has a pantry and a linen closet and that's it. Honestly. When we built the house, nine years ago, there were no children, no real plans for any and we'd just returned from years of travelling and living out of a backpack so a linen closet and a pantry seemed very 5-star and mature (and just to prove how much in backpacker mode I was, I even took out the walk-in robe from our design because I didn't think I would fill it. I know - what a fruit loop.). Enter children, possessions and time and this little house is bursting at the seams. Every nook, cranny, cupboard, basket and box is full of something. "A closet or room in your house where you put everything you don't know what do with; just crammed with stuff, and very messy. From the TV show "Friends". The character Monica was an obsessive neat-freak, but it was revealed in one episode that in fact she had a closet stuffed completely full of junk." The thing was, I actually had two issues. Not only did I have a closet that had become a rubbish tip, I was also trying to contain an ever-growing fabric collection, storing it all over the place in baskets, boxes, bags and on my dining room table (for a neat-freak that's just not on). I knew I had to find a new home for it all and preferably a visual home where I could glance at my supply rather than having to rifle through the whole stash. The only place I could think of was "Monica". I knew she could do it but, boy, did she need some loving to bring out her true potential. The truth is, I had no choice, "she" was my only option so "loving" it was. The big stash sort out. Emptied and cleaned out the entire cupboard (except the bit where the vacuum cleaner and dusters live - that's a whole other project). A fresh coat of paint would've really freshened things up but I didn't want it to become a mammoth project. Ditched, donated and divided all the "stuff". Asked my husband to install a curtain rod to the middle area. Bought three new plastic boxes (on sale at K-Mart). Bought 24 trouser hangers from Spotlight (very cheap). Filled the boxes and labelled them (I used these lovely labels from the BHG site). I decided to hang my fabric so that I could easily see it at a glance but also because I still needed the storage space for other stuff and this way I could utilise the area underneath it. I could've also popped matching boxes or baskets along the top shelf, and I don't know if it's just me, but not everything fits neatly and perfectly into pretty baskets so I would've just been doing it for aesthetics and not for practicality. I actually prefer the freedom and flexibility of simply stacking my bits, which also makes them easy to access. And I know this is considered dangerous (and I'm generally not a risk-taking type of person!) but I've labelled one of my boxes, "Orphans". Again, some things just don't have the perfect home or category so now they can live together happily, keeping each other company in their very own "orphanage". I'm really liking "Monica's" facelift and although it ended up taking quite a few weeks, I am happy that I kept "plucking" away at her to eventually get the job done. 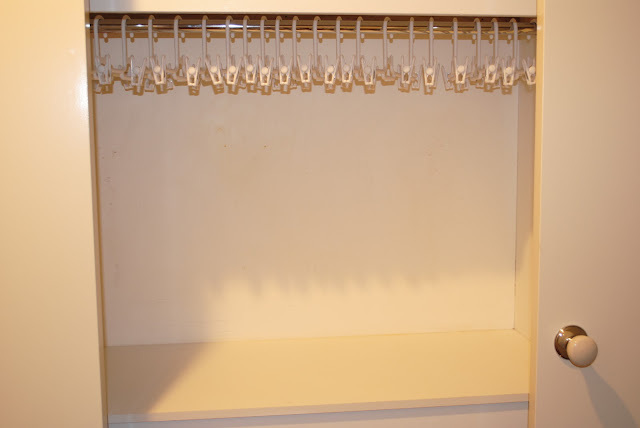 I've now got a super-clean, super-neat cupboard AND a place for my fabric. The only downside is, now that all my fabric is staring me in the face, I really should start doing some sewing and even worse, what excuse do I have now for yet another trip to Spotlight? How about you? Do you have a "Monica" living in your house? Please don't let me be the only one. That looks so organized and neat! Love it. The hanging fabric makes it look so pretty and easy to find too. So weird! I did this the last time G was on break. 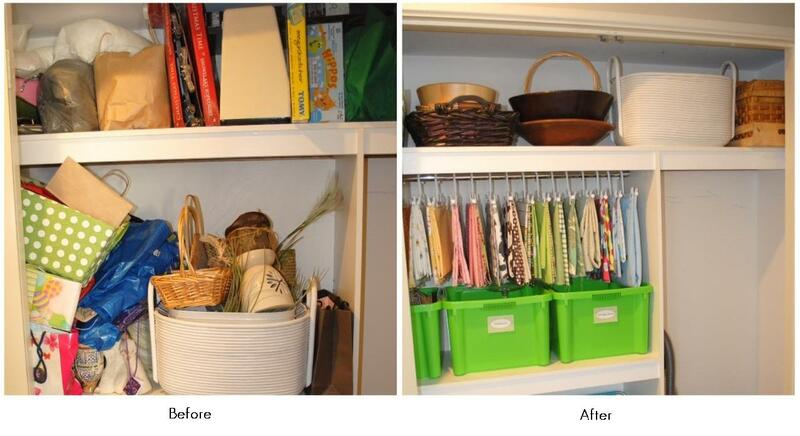 My junk cupboard is now the OCD cupboard with a little help from IKEA. I hope nothing else isn't going on.. like nesting... ha ha as if..
Love the hanging fabric, SO clever!! Love the whole makeover. It looks great! I love the hanging fabric, just providing inspiration for when you are ready or have time! Your newly organized closet looks amazing! Love how you hung the fabric and the cute labels always make me smile big! Thanks so much for sharing! !